Diamonds are without a doubt the single most important gemstone. Most jewelers depend on them for a major portion of their annual income. 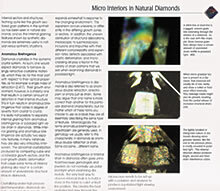 Diamonds are also one of nature's most unique and intriguing treasures. 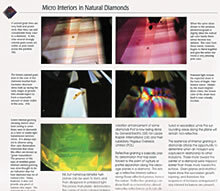 The MicroWorld of Diamonds portrays this most unique gem in an entirely different way—through the microscope. 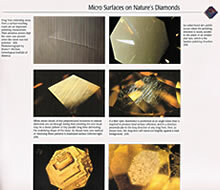 Not only are the micro characteristics of nature's diamonds illustrated in this work, but the industry-wide problematic areas of diamond enhancement, diamond synthesis and diamond simulation are also covered extensively. Hardbound, 10 x 10.5 x 1, shipping weight 2 lbs. 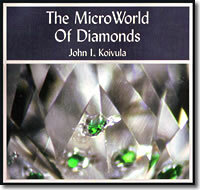 Utilizing a variety of illumination techniques developed or adapted for application to gemological microscopy, John Koivula has thoroughly documented the sometimes colorful and always intriguing microscopic world of natural diamonds and their unnatural relatives. 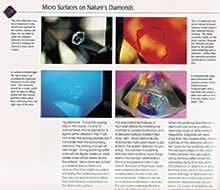 Through a series of 400 specially selected color photographs, The MicroWorld of Diamonds, like no other book, points out in vivid detail that "The heart of a diamond reflects the beauty of nature." This book is available through GIA (USA) bookstore.